Below are comments about Ashlyn1450's artwork that have been left by teachers, family or other website visitors. You do an awesome job, I always enjoy seeing your work. Keep up the the nice art work! Creative! You are very talented! Ashlyn, I have been so Proud of you, your painting is better than the other keep up the great work and you will be a Fine Painter someday. Ashlyn, This is a beautiful flower. It is so well done. Keep up the good work. The colors are so well blended. Love it !!!!! Grandma B.
Wow! That is an awesome piece of pottery. You are a talented artist, keep up the beautiful work! 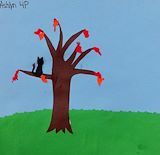 Ashlyn I have been looking at all your Art work. you have really improved so much,keep up the good work. Ashlyn, you are a wonderful artist. I always enjoy looking at you artwork. I had fun making ornaments with you on Thanksgiving weekend. See you soon! You make such wonderful paintings Ashlyn. You are a fantastic artist Ashlyn. Ashlyn, I'm so proud of you. Beautiful Turkey! Ashlyn, I think that looks like Boots sitting in the tree for Halloween. Good picture. Keep up the good work. Ashlyn You are doing a Great Job with your art. Keep up the Good Work,Waiting for you Next One. Love the sunrise! You are a talented artist! Ashlyn, I really like the Tiger picture. It is very well done. He has such a cute expression on his face. Keep up the good work. Ashlyn, Your pumpkin is dressed so well for Halloween. The black cat is there to see that everything goes well on that special day. Keep up the good work. I like this Fall picture. I like all your pictures. I love this picture of Gracie. Wow! What a beautiful picture of Gracie. I am very proud of you Ashlyn. 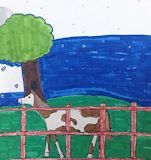 Ashlyn, The picture of the horse is exceptional. It looks just like Gracie, doesn't it? Continue the good work. I love to see your pictures. Beautiful colors Ashlyn. Keep up the good work. I like seeing your artwork. I think this is my best art yet! This is awesome sweetie! You're very talented!